Even if you consider yourself to be a careful driver, all vehicles eventually need expert maintenance to keep them running safely and efficiently. AAMCO of Ypsilanti offers full-service maintenance and auto repairs in Ypsilanti and Ann Arbor, all of which come backed with our comprehensive warranty for your protection and peace of mind. 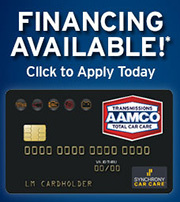 Whether you need transmission repair, an engine tune-up or your brakes inspected, bring your car into AAMCO of Ypsilanti today. Thanks to our advanced, state-of-the-art computer and electrical diagnostics, tools, and equipment, you can count on us for correctly diagnosed auto repairs. Not only do we operate on personal cars of all makes and models, foreign and domestic, but service fleet vehicles as well. AAMCO of Ypsilanti is proud to bring the area some of the best and reliable auto repair services you can find in Ypsilanti and Ann Arbor, MI. By only using dedicated and official diagnostic tools operated by licensed service technicians, we guarantee our work to be satisfactory. Your car seems to always break down at the worst possible times, leaving you stranded. Call today to learn about how we can come get you and take care of your vehicle repair needs. Repairs are often required unexpectedly and can be costly given the nature of the issue found in our expert diagnoses, but we want to help by offering financing options upon credit approval to our customers to lighten the financial load and get you back on the road. Contact us today for more details or to schedule your next auto repair in our facility!